I spent half of my Saturday morning roaming Paterno and Gomez Streets in Quiapo. It had just rained, so the streets were soaked in what looked like mud admixed with the horrible things people in Manila like to throw around. I had been there before, during an immersion in my medical anthropology class with Dr. Michael Tan, but this was the first time I went there alone. I wanted to find old frames. Vintage eyewear, they call it. I started wearing glasses when I was 14. I didn't have headaches or nausea, but when the world seemed clear when I had put on Michelle Tolosa's spectacles, I knew something was wrong with my eyes. My mother told me I should not have tired my eyes out with those books—I'd get sick of them when I'd be in medschool, she said. But at the back of my mind I was excited. I'd look smarter with my glasses on, I thought. On hindsight, maybe she was right. The first pair I had was an oversized black, half-rimmed Tag Heuer. It was ill-fitting for my face, but the rectangular metal frame looked good enough. It lasted me years. I got my second frame when I got to UP. I got an affordable, durable, brandless, metal, half-rimmed frame from Nella Sarabia's charming store in the Shopping Center. The glasses fit me well. The pair lasted me years, too, until the screws got loose. I was too lazy to have them replaced. Around my third year in college, I got a new one. The brand was Swatch; it was brown and rectangular. I got it from Nella's store, too. It fit my face perfectly. It would last me years. It was that durable I was still able to use it yesterday. In my fourth year, I tried out a plastic frame. I wanted a simple design--black and thick-rimmed. I already eyed a particular frame, until my optometrist grabbed something from her drawer and showed me another one. She said, "If you pick that (referring to my earlier choice), you'll have glasses that's the same as everyone's. But if you pick this, you'll be the only one who has it." The frame was old, with two metal studs (almost inconspicuous, really) at the corner, and the design screamed fifties fashion. I loved it. 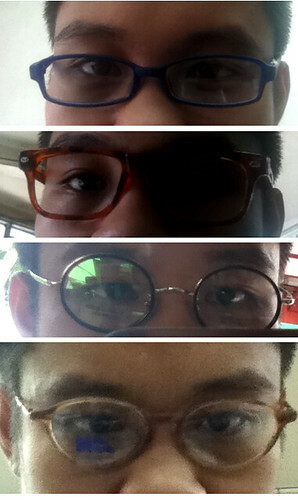 That was the first time I actually thought of the value of old eyeglasses. They possess a certain charm, pretty much like a shoutout from people of earlier generations. Maybe this fondness for old things drove me to Quiapo. But the truth is, I just wanted a new pair because my vision was deteriorating again. 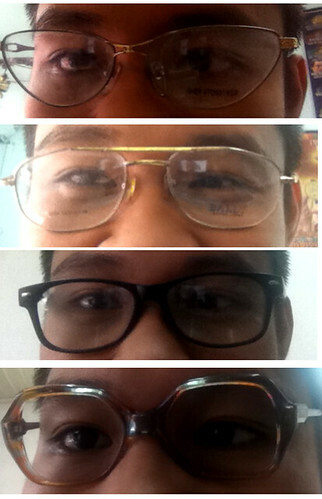 So there I was, in the heart of Old Manila, hopping from store to store, asking for old, even second-hand frames. And I found these. They looked charming and historical, but I thought they were too big. I wanted something smaller, preferably with angular edges, and they should sell cheaply. So I found these. One frame stood finally out. That's the rule when it's hard to pick: wait for something to stand out. The frame was lightweight. It felt comfortable. And it was just the right shape. I got a great deal for Php450! My reason, "Nobody's going to pick this out anyway." One friend told me I look nerdier than usual. Now I have two vintage frames. When I wear them, there's a sense of mystery hounding me. Who wore them previously? And how did they see the world?